From pre-med to Financial & Operations Management Senior Associate, Adam moved from Chicago to New York to began his career at Northwell Health as Healthcare Management Program intern. His experience as an intern opened his eyes to health care and his experience solidified his decision to accept a full time position post graduation in the administration department at North Shore University Hospital. Read Adam’s Q&A about being an HMP intern, now HMP mentor, and how the program was a foundation for his career. Why did you want to participate in the Healthcare Management Program (HMP) and how did you hear about it? When I began my undergraduate studies at Union College, my initial plans had been to pursue the pre-med track, with the ultimate goal of one day becoming a Physician. Upon taking Intro to Chemistry during one of my first classes at Union, and seeing the grade that I received at the end of the term, I quickly realized that this path would not be for me! Fast forward to my junior year, by that time a declared political science major, I remained eager to find opportunities and experiences that would allow me to pursue a role in healthcare, but in a non-clinical capacity. While the majority of my internship search efforts were focused on opportunities related to health care policy, I stumbled upon a unique internship experience that was offered by Northwell Health (formerly North Shore-LIJ Health System). 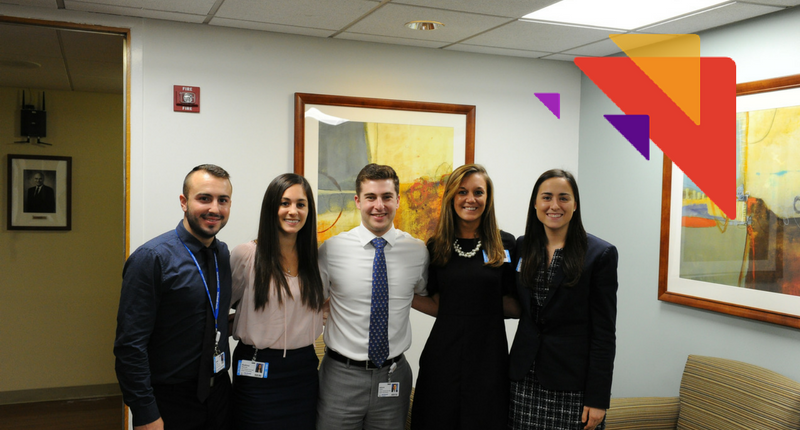 The Healthcare Management Program at Northwell Health is an internship designed to provide students with first-hand knowledge and insight into the field of healthcare administration. This seemed far-removed from my initial interests in policy, but also a far destination for a student originally from Chicago. After speaking with members of the Northwell team, that unbeknownst to me would soon become my colleagues and mentors; I realized that applying to the Healthcare Management Program would be the perfect opportunity to explore my interests in the healthcare field. By participating in the Healthcare Management Program I could fuse my interests in healthcare, business, and policy in a way that no other program or opportunity could provide. Can you tell us about your experience in the internship? As a participant in the Healthcare Management Program I developed the skills required to succeed in a dynamic and fast-paced environment. The internship provided me with an opportunity to explore the field of hospital administration through real project work lead by executive mentors. From the relationships that I developed, to the foundational knowledge gained in both analytics and project management, the internship was a phenomenal experience for my professional growth. Furthermore, the opportunity to learn from, and engage with, executive leadership, clinical leadership, and others, afforded me a unique perspective into the daily roles and responsibilities of healthcare administrators. By gaining exposure to world-class professionals, combined with challenging and exciting project work, the Healthcare Management Program reaffirmed my passion for health care, but more importantly, the experience served as the onramp for my career in health care administration. After participating in the HMP, what made you decide to take a full time position at Northwell Health in our Management Associate Program as a Financial & Operations Management Associate? Through my participation in the Healthcare Management Program I gained the skills necessary to be able to succeed in a dynamic professional landscape. As a result, many of the tools that I developed in the internship provided me with the ability to engage with a variety of different organizations, including financial ones, about potential career opportunities. Although I was intrigued by entry-level positions offered by the other companies, I realized that these institutions could never offer the one component of working in health care that I enjoyed the most: the opportunity to impact the life of a patient. My decision to join this organization in the Management Associate Program (MAP) was made for that simple reason: to wake up each morning knowing that in some way shape or form I could impact the life of another. The passion that I felt to continue to grow in the organization that had paved my professional foundation, combined with a desire to pursue a career in healthcare was the two main contributing factors towards my decision of joining the Management Associate Program. How was it mentoring an HMP intern this summer after going through the program yourself? After having been a participant in the program myself, the opportunity to mentor three Healthcare Management Program interns this summer was a phenomenal experience for me both professionally and personally. From a professional standpoint, just as the Healthcare Management Program provided me with an opportunity to learn a skill set in analytics and project management, mentoring students this summer allowed me to develop my own management skills and style. It was a great experience to be able to train others on the same tools that I had been taught when I had gone through the program just a few years prior. On a personal level, the investment that I had in the program as a former participant made the dedication level to the success of the internship experience that much higher. My goal for the summer was to ensure that the students had as beneficial of an experience as I had, if not better. As one of their mentors, I wanted to provide them with as many opportunities to develop their skill set, form professional relationships, as well as encourage them to cultivate the same passion for health care that I had gained during my own internship experience. The mentorship experience was tremendously rewarding and I am glad that as a former participant I had the opportunity to help others begin their own professional journeys. Our 2017 Healthcare Management Program is now open for submission. Become part of our 61,000 strong and submit your resume today.